Yesterday was a busy afternoon for sports on Culver Academy’s campus with three home games scheduled. The afternoon started off cloudy, but things cleared and all the games were played. 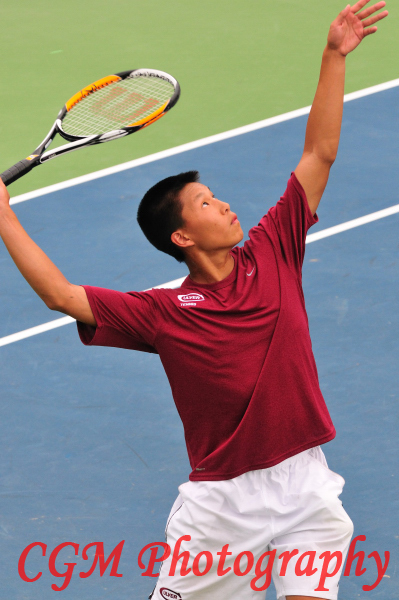 The first event was a JV tennis match against LaPort LaLumiere. The men’s JV soccer team played next against Chesterton High School, and it was followed by the CMA varsity soccer game against Chesterton. All of the teams played well. The JV soccer team won by two goals, and the varisty soccer team lost by two goals. The Chesterton soocer team is a good opponent for Culver as both the JV and Varsity teams were well matched with no clearly dominant team. The final scores could have easily gone the opposite way. 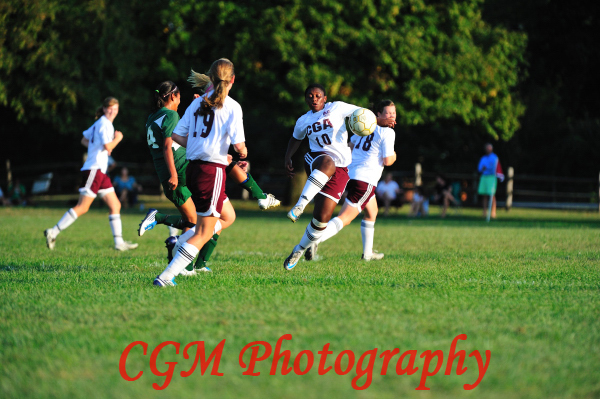 The other night, Ginny and I shot the first regular season home game of the CMA Eagles against the Northwood Panthers. It was played on Culver Academy’s campus overlooking Lake Maxinkuckee. I was looking forward to this game, as this was the first sporting event at which I could use my new camera, the Nikon D3S. I purchased it over the summer and shot some weddings with it, but I hadn’t been able to use it for action shots. For the camera buffs out there, the Nikon D3S is truly an amazing piece of equipment capable of shooting up to 9 shots a second. The camera’s real claim to fame is its capability to shoot in almost no light, making it ideal for Friday night football games, weddings, and other events where using a flash might be distractive or prohibitive. At Friday’s game, I decided to push the limits far past anything that I’ve attempted before and I shot the entire 4th quarter of the game with an ISO setting of 10,000. To my surprise, I am happy with the photos and proud to display them along with the rest of the quarters. 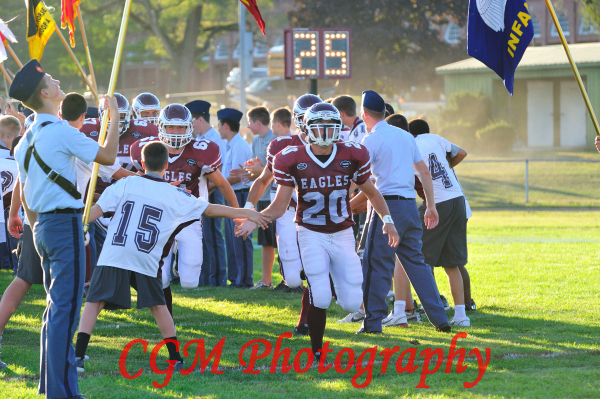 The CMA Eagles held their own against a tough team and in fact, they had the lead for much of the first and second quarters when number 17 caught a long pass from the number 7 quarterback on CMA’s first offensive play. The crowd was loud after that play, and the game remained tight throughout the second quarter. The Northwood Panthers had a tough running game, and they scored going up the middle a few times in the second half. The Eagles made attempts to come back, but they never scored again. I thought they looked like a strong team for a group of guys who lost several seniors in key positions from last year. Ginny and I think it’s going to be a fun season. We hope to travel to some of the away games and keep up with the team. 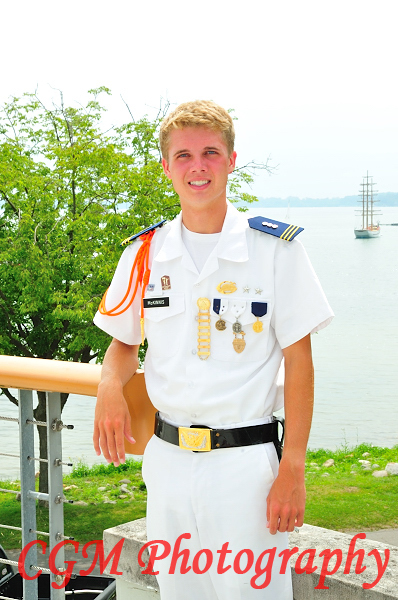 At the end of Summer School, Ginny and I shot high school senior, and now Summer School Almun, Robbie McKinnis in his Summer School Dress uniform on the shores of Lake Maxinkuckee near the Naval Building. Due to a family vacation, we only had one day on which this session would fit into everyone’s schedules. The sky was a little cloudy and hazy, which caused the backgrounds of the photos to lack color, but overall, the photos of Robbie turned out great.